Those under 18 years of age must have consent from a parent or legal guardian. 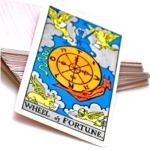 I am a contemporary, genuine, mature Tarot Card Reader experienced for many years with thousands of individuals in deriving personal meanings direct to the enquirer. Tilly Tarot makes no guarantees, express or implied, with respect to: the accuracy, relevancy, or quality of information. And does not assume and hereby disclaims any liability to any person or entity for any loss or damages (including, without limitation, physical, mental, special, indirect, incidental or consequential) caused in regard to any information and/or any suggestion(s) or advice provided to you through this service by any readers at Tilly Tarot, or as a result of your use of this service, regardless of whether resulting from negligence, accident, or any other cause whatsoever.